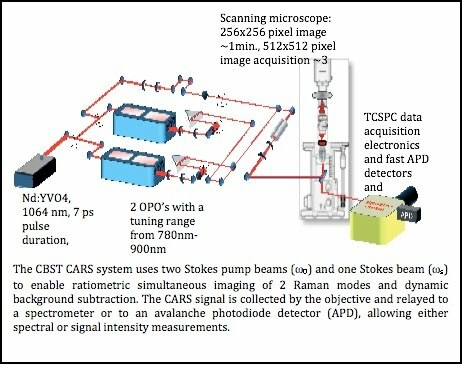 This past year we primarily focused on implementing a CARS (coherent anti-Stokes Raman scattering) optical microscope capable of producing a specific label-free signal sensitive to intrinsic molecular vibrations within the sample. CARS is approximately 5-6 orders-of-magnitude more efficient than spontaneous Raman scattering and thus allows for high-resolution imaging applications and long-term quenching-free observations (optionally at video rates) of living cells and their interactions. This past year we devised several novel methods to improve and enhance CARS microscopy (see figure). This system is one of a few in the world that is able to simultaneously excite two CARS transitions to allow ratiometric imaging of the sample. Furthermore, the CBST CARS group has demonstrated that multiphoton-excited fluorescence signals can be separated from the CARS signal by time-correlated single photon counting. The group also showed that by reflecting the forward scattered signal back towards the backscatter detector using an appropriately placed mirror, TCSPC detection can use this time delay to easily separate forward-scattering CARS (f-CARS) from back-scattered, epi-CARS thus obtaining additional information on structures at different length scales within the sample.